There are 3 distinct phases of the racquet drop, each with there own key points. The first phase is the straightening out of the arm. The next phase is the actual dropping of the racquet. 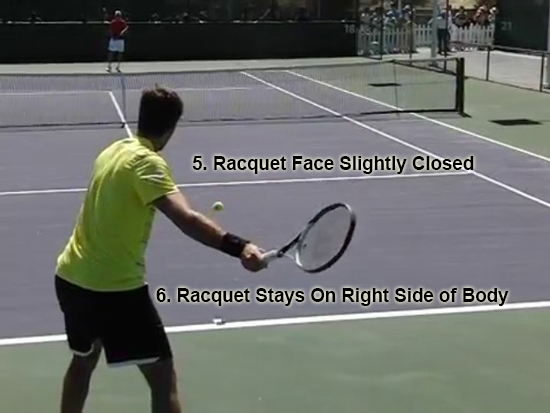 The last phase is the racquet at its lowest point. 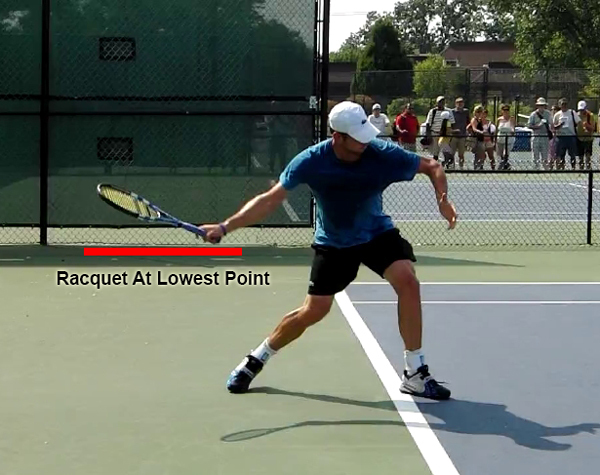 The majority of the key points happen at the lowest point of the racquet drop. One of the key points discussed will be virtually impossible to show here. Letting the racquet drop slowly by using gravity and not arm muscles. 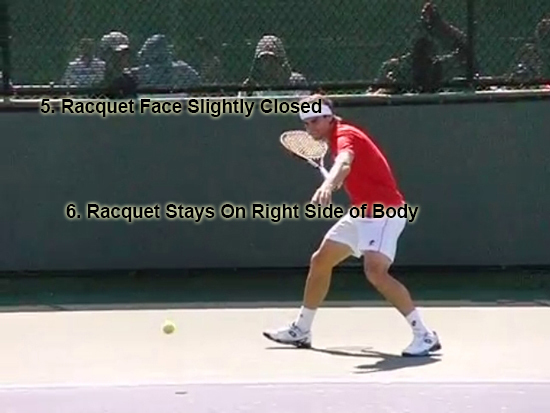 Even though it can not be shown in this section, in the gravity section there is definitive proof that the pro’s let gravity drop the racquet so I would encourage you to look at that section. 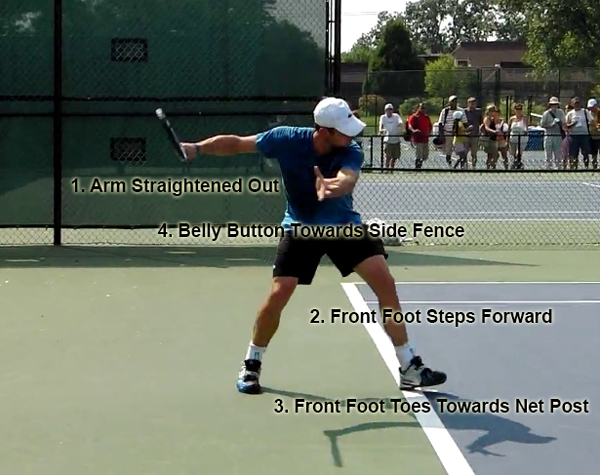 During the arm straightening phase the hitting arm should straighten out and the front foot should be stepping forward if using a neutral stance. 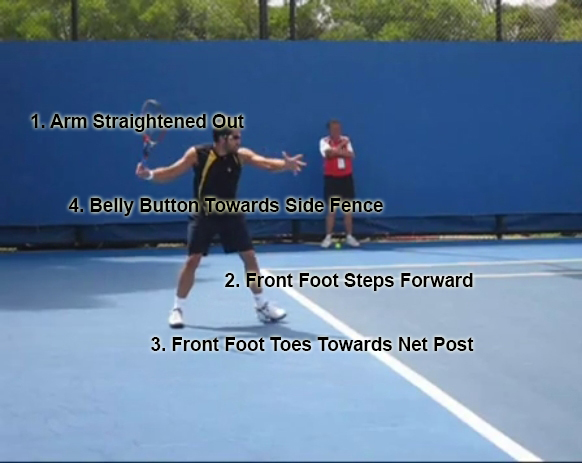 The toes should also be pointing towards the net post. 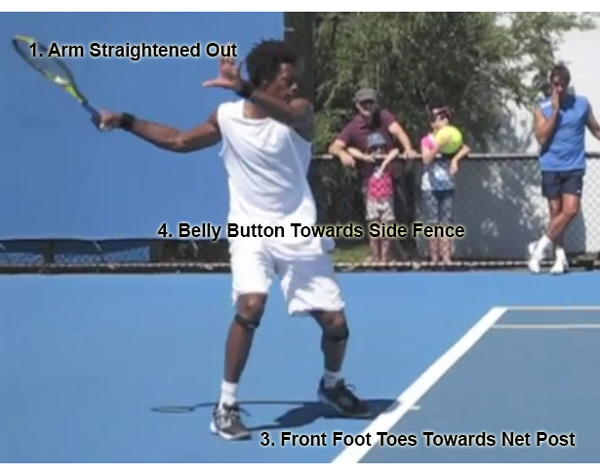 Since no uncoiling of the body should have started yet the belly button should still be pointing towards the side fence. Hover over the below images to see these 4 key points done. 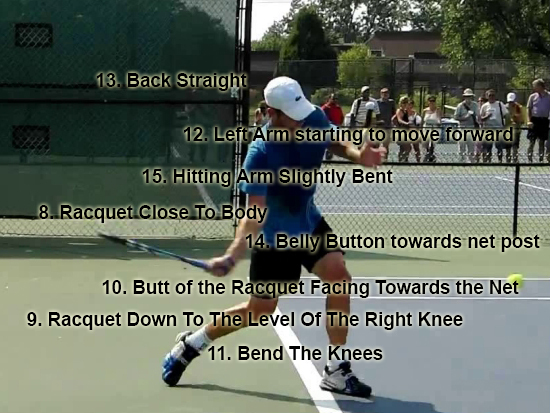 The first example is Andy Roddick of the 4 key points in this phase Andy does all 4. 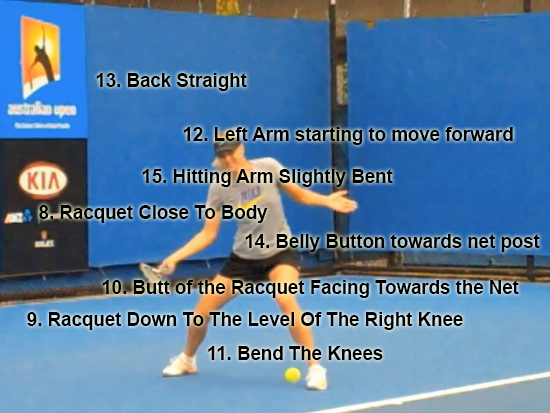 Next is Ana Ivanovic – Ana does all four key points as well. 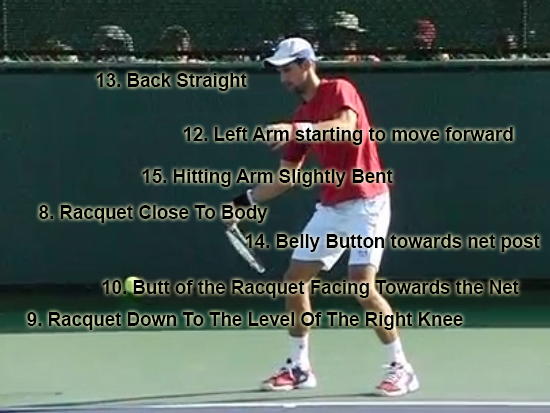 Novak Djokovic also does all 4 Key Points. Even though he uses an open stance he still steps forward. 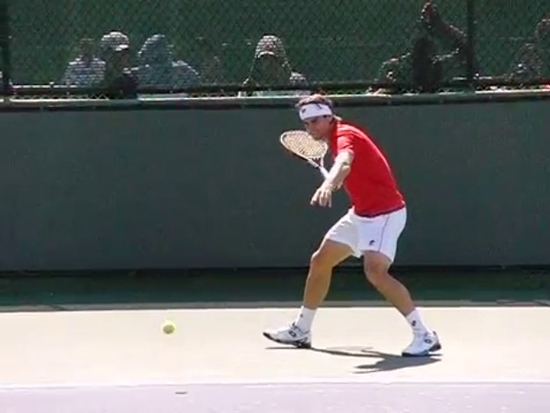 His open stance is not quite as open so he can step forward. 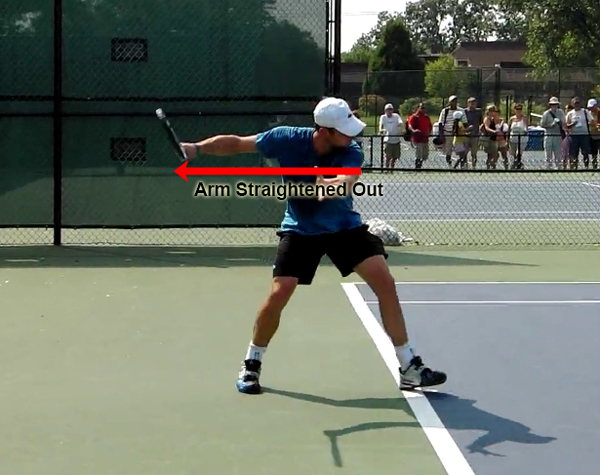 The more open the stance is the less likely a step will be done. 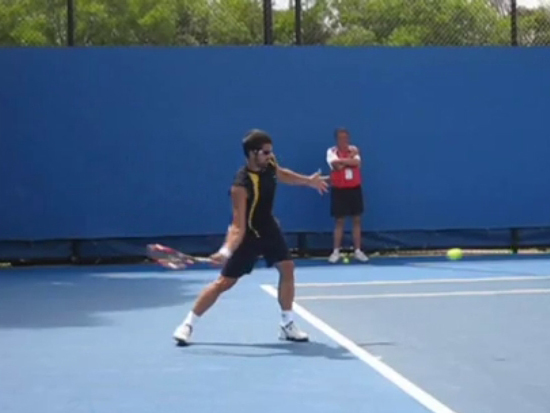 Janko Tipsarevic also does all 4 of the key points. 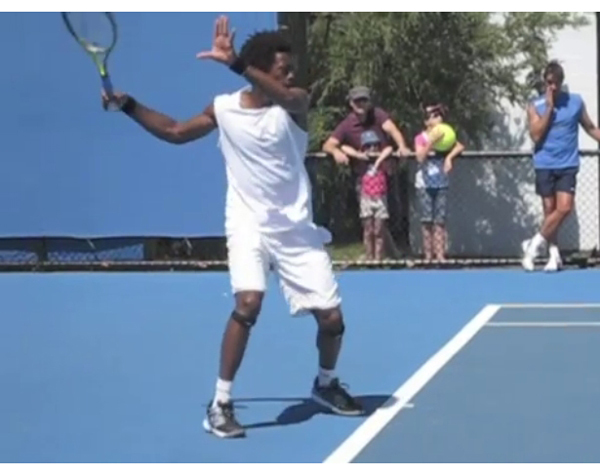 Gael Monfils uses an open stance so he does not step forward. But this is usually what happens with open stances and is one of the benefits of the stance. It interesting to note that he still has his belly button pointing towards the side fence. 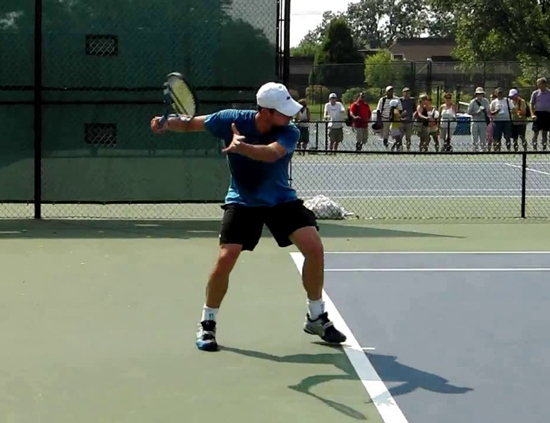 Many players who hit with an open stance will not rotate the body as far as they would if they had a neutral stance. 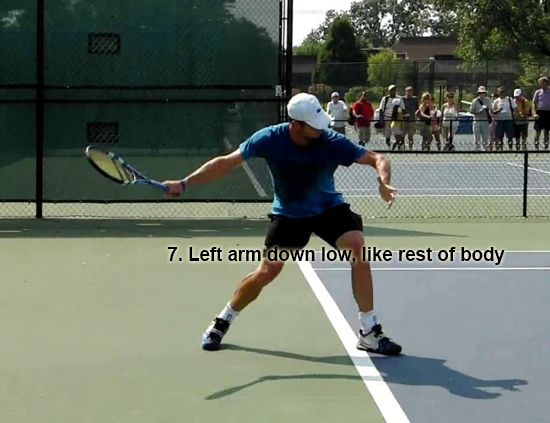 If using an open stance you still need to rotate the upper body the same as if using a neutral stance. This is what most pro’s will do. 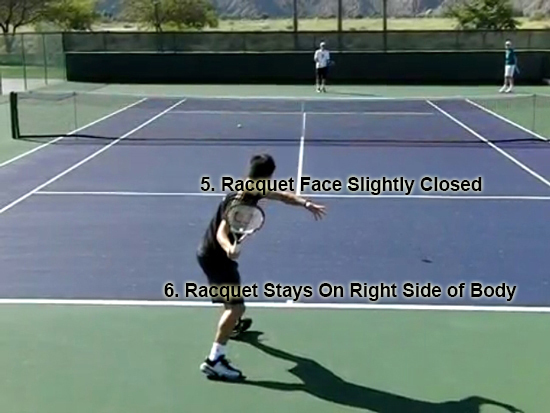 During the racquet drop phase there are three key points that can be shown. 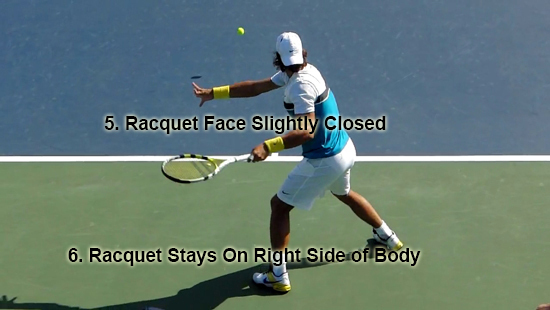 The racquet face being partially closed, the racquet staying on the right side of the body and the left hand lowering as the racquet lowers. The racquet dropping due to gravity can not be shown, but is explained here. Every pro shown below does all of these key points. Hover over the below images to see the first two key points highlighted. 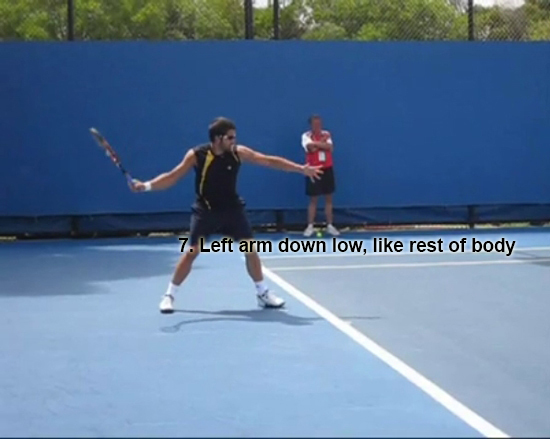 In the next section the left arm dropping can be seen clearly. 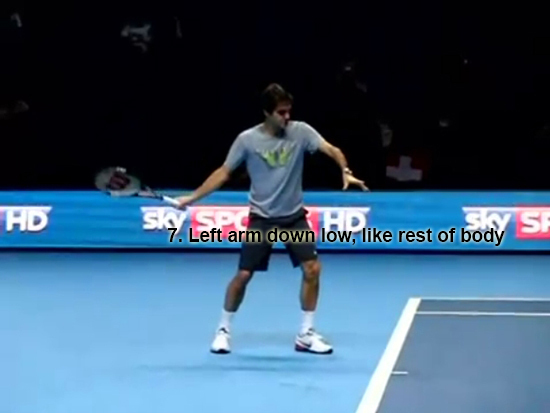 By the racquets lowest point all the other key points of the racquet drop are done. As with the other phases, most of the key points required to hit a good forehand are done by the pro’s. 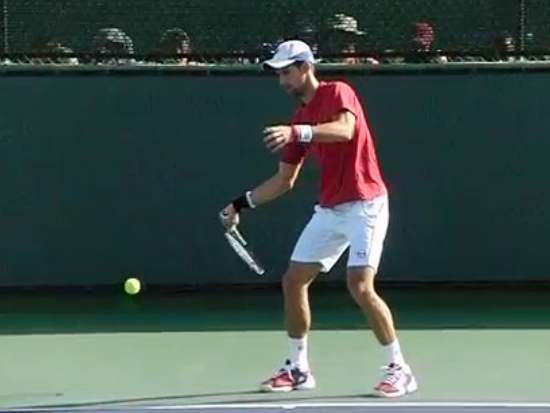 The first example is Novak Djokovic of the 8 Key Points of the racquet drop at this phase Novak does 6 of them. 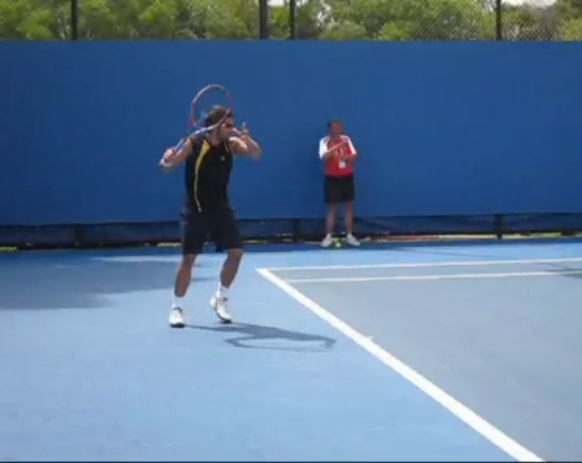 In this example Novak does not bend his knees as the racquet drops. This leads to him not getting his hitting hand down by his knee. 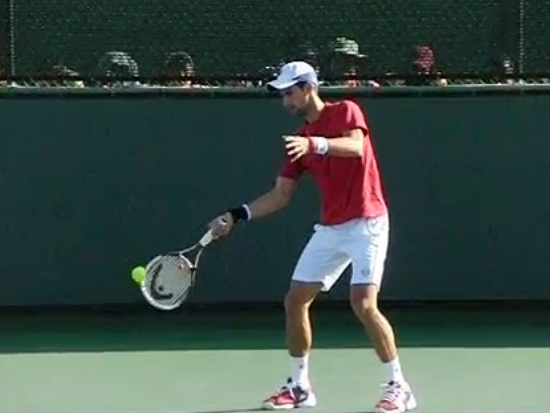 By not bending his knees Novak will be forced to lower the racquet head well under his hand. Hover over the below image to see this happen. Novak being a great player can get away doing this without losing much racquet head control, but most players could not get away doing this so I would not recommend doing this. The next example is Janko Tipsarevic, of the 8 key points Janko does all 8. 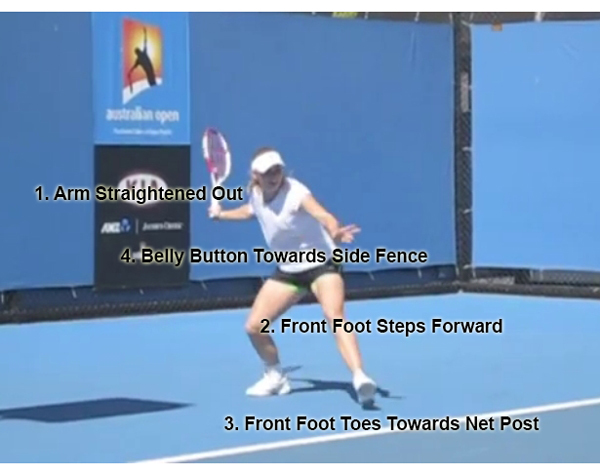 The next example is Maria Sharapova, of the 8 key points Maria does all 8. She does have her left arm a little bit further away from the right arm then I would recommend. 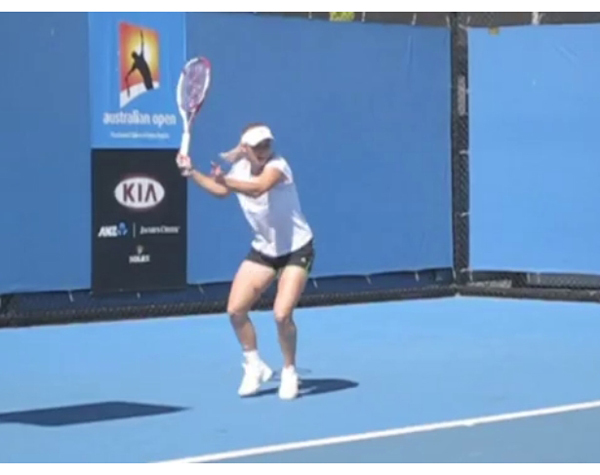 She does this to aid in the acceleration of her right arm as the sooner the left arm stops the sooner the right arm accelerates. The problem with doing this for most people is that it can facilitate a horizontal swing. Maria will not make that mistake. 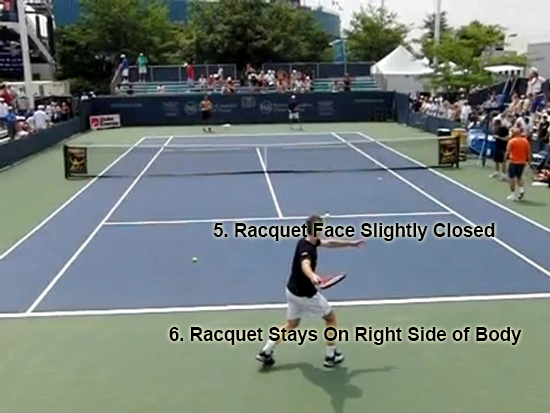 The last example is Andy Roddick. 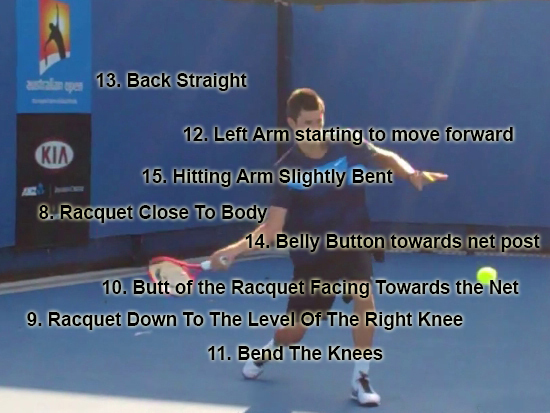 Andy does all 8 of the key points. As the saying goes a picture is worth a thousand words. 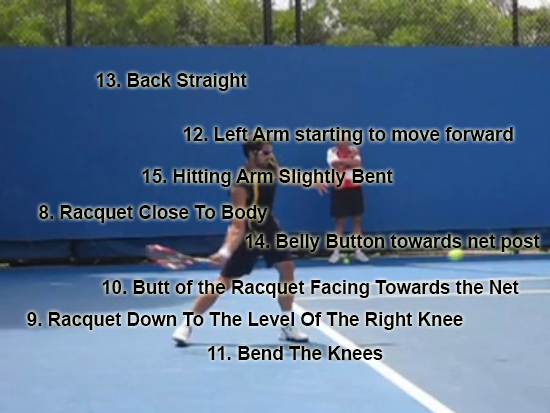 By seeing the pro’s doing the key points, I hope it helps you see the importance of proper technique.